Anyone who loves or even just appreciates science will tell you that there’s something beautiful about it. At the same time, those who love or even just appreciate art, often admire the technique and scientific precision that can go into creating a masterpiece. This week we had a chance to experience several engaging products that blur the lines between art and science. SAN DIEGO – STEM is an acronym that stands for Science, Technology, Engineering and Math. While most science and technology curriculum that is taught in school today are focused on starting in 7th grade, Jeane Wong, CEO/ Founder, League of Extraordinary Scientists & Engineers (LXS), believes that children benefit from being taught this same curriculum starting as early as possible. With this in mind and understanding the research, LXS is answering the call by bringing together a literal League of Scientists & Engineers with educators to make available “hands-on-science-ing” to Pre-K to 5th grade learners and in-classroom support for their educators. Research from the Joan Ganz Cooney Center shows that kids are more excited to learn when they use a tablet or a toy, because it does not feel like forced learning. Boolean Box (booleangirltech.com) is a self-contained computer engineering kit for girls (and boys) that encourages them to code, build, invent, and animate. The Curiscope Virtuali-Tee (curiscope.com) is an Augmented Reality T-Shirt that allows children to learn about the human body — on a human body. Getting started is as simple as pointing your phone at the shirt and opening a portal to another reality – the world under your skin! Augie (www.pai.technology) is the first premiere coding robot equipped with augmented reality technology. Developed to introduce children to coding language, it engages imagination and creativity while helping children further enhance critical thinking and problem solving skills. Circuit Conductor (www.pai.technology) teaches children about electricity, currents, and magnets through fun, imaginative Augmented Reality play. Use 12 different electrical function blocks and special insulated wires to build fun circuits and learn about electricity through the free app. Easy-Macro (www.easy-macro.com) Makes your phone camera even better! Easy-Macro is the simplest, most convenient and easiest to use macro lens available for smartphones. It’s 4x magnification gives your phone’s camera close-up powers that you never thought possible. 20% off with PROMO CODE: STEM. For more information, visit the League of Extraordinary Scientists & Engineer’s website: science-ing.org. As featured in USA Today! Children attending K-12 were born into a digital world. Some say that computer literacy is as foundational as reading, writing and math. Teaching code not only prepares students for STEM careers, but gives them a better understanding of machines they will interact with the rest of their lives. A 2014 study found that when people work with source-code, five brain regions are activated related to language processing, working memory and attention. While more research is needed, this indicates early computational thinking can mold multiple regions of the brain. In a study conducted by Bayer, more than 77 percent of female and underrepresented minority chemists said gender and race disparity in STEM is caused by lack of encouragement to pursue STEM at an early age. By targeting basic STEM skills like coding, schools can facilitate early interest in STEM careers. While 71 percent of all new jobs in STEM are in computing according to Code.org, only eight percent of STEM graduates studied computer science. Today’s students could fill those gaps in the job market more easily if they learn coding at an early age. More than just a science, coding enables students to develop important personal abilities like their sense of creativity and self-expression. When developing code, students impact the world around them while fostering problem-solving skills. Engagement soars when they see real-world connections to lessons they’re learning. We’re excited to share that Augie the Coding Robot has won the National Parenting Center’s Seal of approval! Check it out here, and find Augie in Target stores near you! A few weeks back I was the keynote speaker at a gathering of cosmetic chemists; my topic was encouraging women not to be the hidden figures in the sciences. One of the things I learned while researching my speech was that to have women in the science, technology, engineering and mathematics–or STEM–fields, you need to find new ways to reach girls, and teach them through action that science isn’t just for boys. So, if you’re interested in nurturing your own budding Marie Curie or Ada Lovelace, these games are great for both girls and boys. Some are strictly STEM, while some also incorporate the arts. Augie is both a coding robot and toy developed to introduce children to coding language. It also fuels their creativity by challenging their imagination. It’s hard to explain just how fascinating this toy/not a toy is and how it helps build and enhance critical thinking and problem-solving skills. It’s also a way to introduce kids to artificial intelligence and takes digital nativism to a new level. NEW YORK — Augmented reality (AR) continues to be incorporated into a large number of toys and games targeted at kids, but interest in standard virtual reality (VR) requiring headsets seems to be on the decline among toy makers, according to interviews the Media & Entertainment Services Alliance (MESA) conducted at the annual American International Toy Fair Feb. 17-20. Interest in artificial intelligence (AI), however, seems to be on the rise among companies making toys. The incorporation of AR, VR and other technologies into toys was included by the Toy Industry Association (TIA) in its list of the top toy trends for 2017 that were announced at last year’s show. And TIA announced Feb. 18 at Toy Fair that it “expects to see more affordable and user-friendly virtual and augmented reality toys, interactive and buildable robots with new features” this year. While the AR part of that prediction was underscored by our conversations with several Toy Fair exhibitors, the VR portion of the forecast was cast into some doubt by what most of the exhibitors we interviewed said. In addition, one of the companies fielding VR products at the show last year – Seedling – wasn’t among the exhibitors this time. Uncle Milton, meanwhile, didn’t announce any new VR products at the show this year after touting several such items there in 2017. The main story at Pai Technology’s Toy Fair booth this time was Augie, a $199.99 coding robot for kids, equipped with AR technology, that was developed to introduce kids to computer coding language, according to the company. The robot also was designed to engage kids’ imagination and creativity while helping them to improve their critical thinking and problem-solving skills, Pai said. Augie works in conjunction with an Android and iOS app. Pai showed a prototype version of a coding robot at Toy Fair last year, but a finalized version of Augie was shown for the first time at the Consumer Electronics Show in Las Vegas in January, Sherry Wu, the company’s global business strategy director, told MESA Feb. 17. It’s already being sold by Amazon and 32 Barnes & Noble stores, she told us. Augie is also being sold at Barnesandnoble.com. 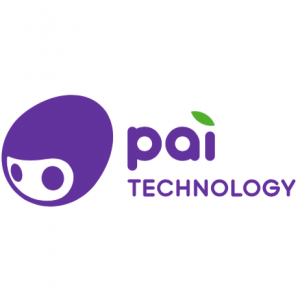 Pai is in talks with additional U.S. retailers to widen its availability, Wu said. 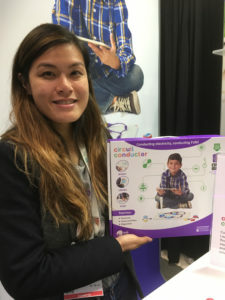 Also touted by Pai at Toy Fair was Circuit Conductor, a $69.99 educational kit, also featuring AR, that teaches kids about electricity, currents and magnets. The company, which opened a Santa Monica, California, office in 2016, has positioned itself as a provider of AR STEAM (science, technology, engineering, art and math) experiences. STEAM (often STEM, minus the art) has been a dominant theme at Toy Fair in recent years and that trend continued for 2018. Augie featured on The Toy Insider! Read the full article here: https://www.thetoyinsider.com/augie-augmented-reality-robot-review/. “The future is now Augie. Augie Augmented Reality Robot, from Pai Technology, merges two popular trends in the toy aisles right now: coding and augmented reality (AR). The minibot is designed for preschool kids and introduces them to coding concepts in a fun and engaging way. Augie is a tiny, sleek-moving robot with a circular screen that looks like an eye. The “eye” will flash images on its screen depending on the action it is performing, and the speakers on the side of the bot play sounds, helping Augie to come to life. It also has four wheels on its bottom, two of which rotate in all directions so that Augie can glide with the grace of a three-time Olympic gold medalist. Once connected to the Augie app on a tablet or smart device, kids will get to dive into the many features that are available at their fingertips. There are six ways to play with Augie: Freeplay, Trailblaze, Coding Classroom, Coding Control Center, AR Adventures, and AR Coding. When little ones want to put their coding skills to the test, they can try out one of the coding modes. The Coding Control Center lets kids feel strong and powerful as they build codes and commands for their tiny friend to follow. Coders can use the functions on the left side of the panel to control how Augie moves, what sounds it makes, and what it displays on its screen. Kids can easily edit and remove functions if they are not satisfied with the end result, and once they like what they have created, they can save the command and access it at any time. Kids will spend hours coding commands that send Augie in all direction in the kitchen, and then top it off with a barking noise that will fool even the slyest house dog. Freeplay is an easier way for kids to interact with their smart friend. Using a smart device, kids can move Augie forward, backward, left, and right. They can even change the color of the lights that it emits, and play noises or record their own silly sounds for it to project. For even more fun, tilt the tablet and prepare to be amazed as Augie moves in the same direction. Trailblaze is a similar mode where kids draw a path for Augie to follow, and then add fun effects for it to display on its screen. The AR Adventures combines the challenge of coding with the excitement of AR. During this mode of play, kids use the bottom control to play the game, and the touchscreen joystick to move Augie around and help him battle the enemy. Players help Augie release lasers and collect the AR coins as they improve their health and move through each level. Kids can play games such as Hide and Seek and Super Augie Maze, or even create unique games and control how it is played by dragging obstacles and setting time parameters.